Illinois native Douglas McCain was a convert to Islam and foreign fighter for ISIS. Syrian rebels reported that McCain was killed fighting for the terror group on the weekend of August 23-24, 2014. 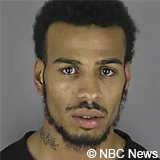 He was the best friend of Troy Kastigar, an American who died fighting for al-Shabab in Somalia in 2009.Cassandra Vinograd and Amar Cheikh Omar, “American Douglas McAuthur McCain Dies Fighting for ISIS in Syria,” NBC News, August 27, 2014, http://www.nbcnews.com/news/world/american-douglas-mcauthur-mccain-dies-fighting-isis-syria-n189081. Federal law enforcement began monitoring McCain in the early 2000s as part of a larger investigation of potentially radicalized Somalis in Minneapolis. McCain was placed on a travel ban of individuals at risk of leaving the United States to fight abroad.Holly Yan, Sonia Moghe, and Greg Botelho, “Douglas McAuthur McCain: From American kid to jihadi in Syria,” CNN, September 3, 2014, http://www.cnn.com/2014/08/27/us/who-was-douglas-mccain/. Between 2000 and 2003, McCain was convicted of multiple crimes, including disorderly conduct and marijuana possession.Holly Yan, Sonia Moghe, and Greg Botelho, “Douglas McAuthur McCain: From American kid to jihadi in Syria,” CNN, September 3, 2014, http://www.cnn.com/2014/08/27/us/who-was-douglas-mccain/. It is suspected that McCain converted to Islam in 2004 based on a 2014 tweet in which McCain celebrated his conversion 10 years prior. Tweets published by McCain in 2012 were the first indications of his growing religiosity.Terrence McCoy, “How Douglas McAuthur McCain became the first American to die fighting for the Islamic State,” Washington Post, August 27, 2014, http://www.washingtonpost.com/news/morning-mix/wp/2014/08/27/how-douglas-mcarthur-mccain-became-the-first-american-to-die-fighting-for-the-islamic-state/. A Twitter account allegedly operated by McCain tweeted on June 9, 2014, “I will be joining you guys soon.” He followed up the next day, “I’m with the brothers now.” On June 26 he tweeted, “It takes a warrior to understand a warrior,” and “Pray for ISIS.”Holly Yan, Sonia Moghe, and Greg Botelho, “Douglas McAuthur McCain: From American kid to jihadi in Syria,” CNN, September 3, 2014, http://www.cnn.com/2014/08/27/us/who-was-douglas-mccain/. At the time of his death, McCain was reportedly carrying $800 dollars and his American passport.Cassandra Vinograd and Amar Cheikh Omar, “American Douglas McAuthur McCain Dies Fighting for ISIS in Syria,” NBC News, August 27, 2014, http://www.nbcnews.com/news/world/american-douglas-mcauthur-mccain-dies-fighting-isis-syria-n189081. Duale ThaslaveofAllahCassandra Vinograd and Amar Cheikh Omar, “American Douglas McAuthur McCain Dies Fighting for ISIS in Syria,” NBC News, August 27, 2014, http://www.nbcnews.com/news/world/american-douglas-mcauthur-mccain-dies-fighting-isis-syria-n189081. Duale KhalidHoward Koplowitz, “Douglas McArthur McCain: The Rapping Clown Turned Isis Martyr,” International Business News (London), August 27, 2015, http://www.ibtimes.co.uk/douglas-mcarthur-mccain-rapping-clown-turned-isis-martyr-1462841. Illinois native Douglas McCain was a convert to Islam and foreign fighter for ISIS. “I’m not feelin this Twitter sh– … wallahi I wants fried chicken. … Watching the Help starting to make me hate white people. … Ok its official f— white people.” (Tweet)Terrence McCoy, “How Douglas McAuthur McCain became the first American to die fighting for the Islamic State,” Washington Post, August 27, 2014, http://www.washingtonpost.com/news/morning-mix/wp/2014/08/27/how-douglas-mcarthur-mccain-became-the-first-american-to-die-fighting-for-the-islamic-state/. “I reverted to Islam 10 years ago and I must say InshaAllah I will never look back the best thing that ever happen to me.” (Tweet)Terrence McCoy, “How Douglas McAuthur McCain became the first American to die fighting for the Islamic State,” Washington Post, August 27, 2014, http://www.washingtonpost.com/news/morning-mix/wp/2014/08/27/how-douglas-mcarthur-mccain-became-the-first-american-to-die-fighting-for-the-islamic-state/. “Ya allah…when it’s my time to go have mercy on my soul have mercy on my bros.” (Tweet)Terrence McCoy, “How Douglas McAuthur McCain became the first American to die fighting for the Islamic State,” Washington Post, August 27, 2014, http://www.washingtonpost.com/news/morning-mix/wp/2014/08/27/how-douglas-mcarthur-mccain-became-the-first-american-to-die-fighting-for-the-islamic-state/.